The idea of a Chicago Bears Khalil Mack trade has floated around for weeks. This ever since the ball started rolling when the star defensive end held out from Oakland Raiders training camp. The 27-year old wants a new contract. One that makes him one of the highest-paid defenders in football. Something he feels he’s earned after three-straight years of at least 10.5 sacks. Oakland has not budged from their position. In fact, communication between Mack and head coach Jon Gruden, who also controls the roster, is scant at best. Some, including former GMs, are starting to believe this new Raiders regime may decide to trade their star pass rusher for a cache of draft picks in return. Given how starved the Bears are for pass rush help, the dream of adding Mack to their already impressive defensive lineup one to drool over. Mack paired with Akiem Hicks and Leonard Floyd? Yes, please. Except it’s never that easy. There’s always the logistics that get in the way. Acquiring such a proven player in his prime would be expensive. The thing is people have put an incredible premium on draft picks these days. They think they’re worth their weight in gold even though evidence shows that the majority of them fail to pan out every year. So I decided to look back through history at some of the biggest trades in NFL history that ended in failure for the team acquiring the big-name player. The goal was to see if that trade did indeed cripple the franchise, sending them into a dark abyss for a decade or if they were able to survive. The results were rather surprising. That last one should really open eyes. The Vikings committed probably the worst trade in NFL history. They gave up six future high draft picks for a running back they had for less than three seasons. Yet they went on to become one of the best teams of the 1990s. This is proof that it’s more than possible for a team to survive missing on a big trade. So it’s likely this air of caution from Bears fans is less due to such trades actually crippling franchise and more with something else. What could it be? There’s a simple answer. The Jay Cutler trade. Most see that moment as the turning point of the franchise where it began to slowing sink into the mire its been for almost a decade now. The Jay Cutler trade did not ruin the Bears. Poor management did. In that deal the Bears got Cutler and a fifth round pick for their first round picks in 2009 and 2010 along with Kyle Orton and a third round pick. Is that a lot? Yes. Did it completely ruin the Bears long-term? No. Here’s the thing. The Bears had plenty of opportunities to rescue themselves from that expensive deal after it took place. The main culprits weren’t the lost picks. It was GMs Jerry Angelo and Phil Emery who facilitated the collapse. Their awful combined drafting from 2011 to 2012, both years where the Bears had first round picks, were a bigger factor in things falling apart than the Cutler trade. Try to imagine this. Say instead of Gabe Carimi and Shea McClellin being the two guys selected those years, the Bears had managed to grab Rodney Hudson and Chandler Jones. Both of whom were selected not too long after Chicago picked and became Pro Bowlers. Would things have spiraled so far out of control? Never mind how many outright whiffs they had in the later rounds in both drafts. Nathan Enderle anybody? Evan Rodriguez? Greg McCoy? Part of dealing with the fallout of a blockbuster trade is being able to maximize the picks you have left. That’s what GMs get paid to do, and here’s the thing. It’s something Ryan Pace does well. There’s reason to think he is the type of guy who could survive for a couple years without first round picks. 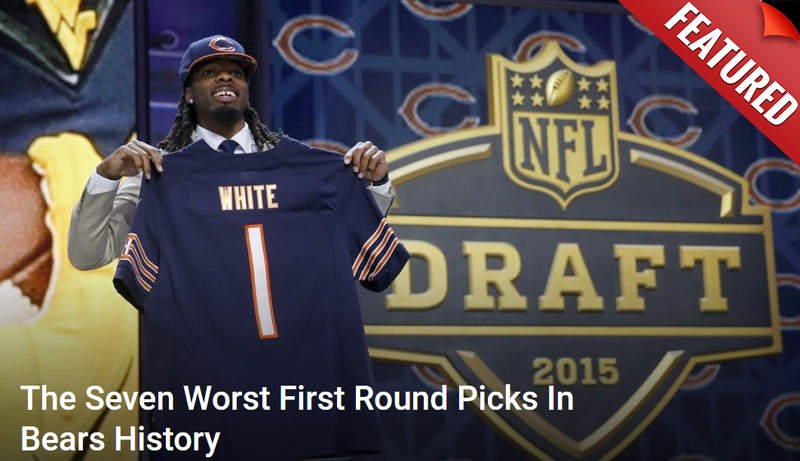 Especially since he’s already done a fair job establishing the young nucleus of this new Bears team. Even if a Mack trade didn’t produce as hoped, he’s proven he can find talent in unexpected places.